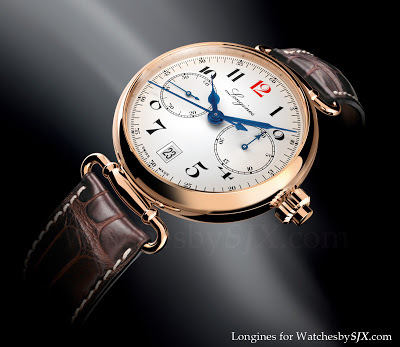 Longines celebrates its 180th anniversary at Baselworld 2012 with a monopusher chronograph styled like early 20th century wristwatches with wire lugs. Surprisingly it is a mere 40 mm in diameter. The dial is white, but not enamel. The movement is an automatic calibre with column wheel, I suspect it’s the Valjoux 7750 with column wheel ETA makes exclusively for Longines. 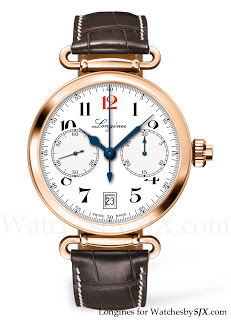 Overall a nice looking watch but a far cry from the high-end chronograph Longines made in the 20th century. This watch, officially termed the ‘Column-Wheel Single Push-Piece Chronograph 180th Anniversary Limited Edition’, is limited to 180 pieces in rose gold.